Frank W. Woolworth had opened his first five and ten cent store in Lancaster, Pennsylvania, in 1879. His retailing concept quickly achieved success, and he began to add more stores, expanding throughout the East Coast and in the Midwest. In 1910 he merged his company with those of four competitors to create the F.W. Woolworth Company, a corporation controlling 611 stores. That same year he began to plan a new corporate headquarters on a site at the corner of Broadway and Park Place, facing City Hall Park, and hired Cass Gilbert as architect. Early in the project, Woolworth was interested in building an office building that would surpass neighboring buildings in height. He was then struck with the idea of surpassing the 612-foot height of the Singer Building, designed by Ernest Flagg and completed in 1907, and the 700-foot height of the Metropolitan Life Insurance tower, designed by Pierre LeBrun of Napoleon LeBrun and Sons and completed in 1909. He instructed Gilbert to prepare plans for an even higher tower, ultimately 792 feet. The ground-floor lobby is a dramatic vaulted space with mosaic-covered ceilings. A grand staircase at the west end of the lobby leads up to what was originally the headquarters for the Irving National Bank. 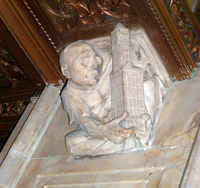 Sculpted figures on the ceiling beams inside the entrance caricature Woolworth, Gilbert, and other major figures involved in the design and construction of the building. 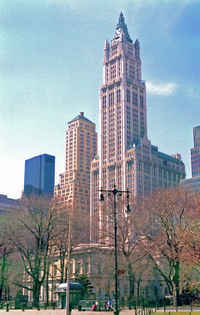 The Woolworth Building was the last major skyscraper constructed in New York before World War I. 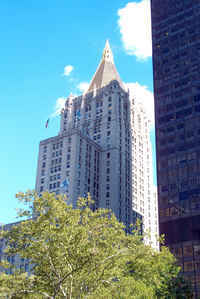 Its romantic tower form helped to establish the prototype for a group of skyscrapers built in the 1930s. The building remained the headquarters of the Woolworth Company until the company went out of business. It was subsequently sold to a New York real estate development group that intended to convert part of it to a residential condominium. Due to economic conditions, this has not happened. Most of the building remains in use as offices.